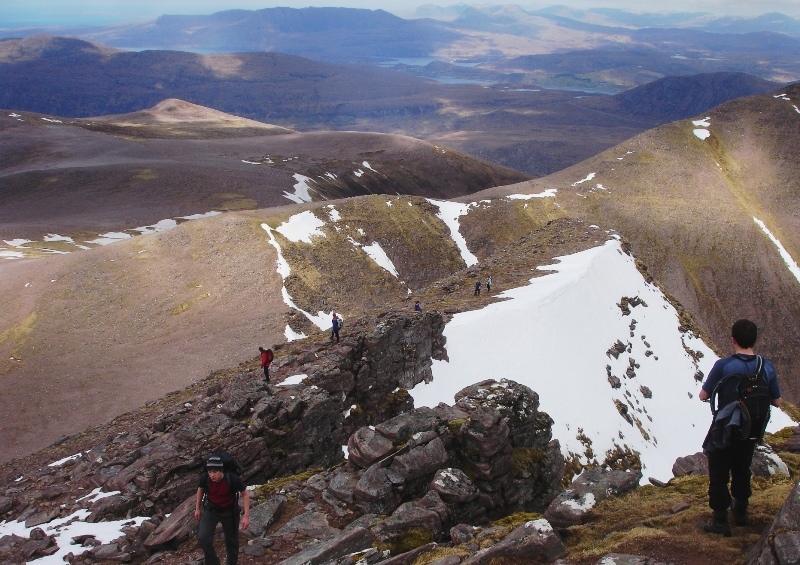 An Teallach is arguably Scotland's most beautiful and is certainly one of its most challenging mountains. 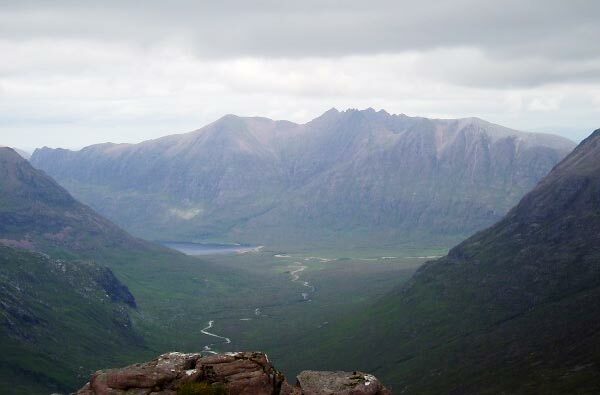 The peaks of An Teallach are arranged in a semi-circle around Loch Toll an Lochain. Bidean a' Ghlas Thuill forms the N wall of this corrie and has a long E ridge leading to Glas Mheall Liath from where a descend can be made to Coire' a' Ghiubhsachain with its gently sloping rocks and dramatic escarpment. The N face of this E ridge is craggy and should be avoided. Bidean a' Ghlas Thuill has a short SW ridge that connects to Sgurr Fiona and a steep rocky N ridge that descends to a broad ridge N of Sron a' Choire from where a stalkers path leads to Dundonnell. Bidean a' Ghlas Thuill is a craggy mountain requiring some minor scrambling. Sgurr Fiona with Bidean a' Ghlas Thuill behind, from Corrag Bhuidhe (An Teallach). 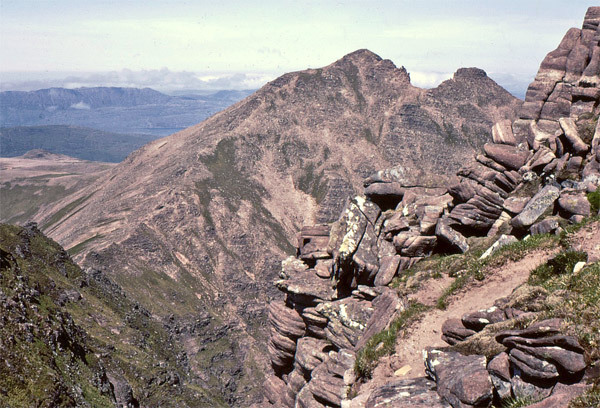 Bidean a' Ghlas Thuill from Corrag Bhuidhe; July 1975. 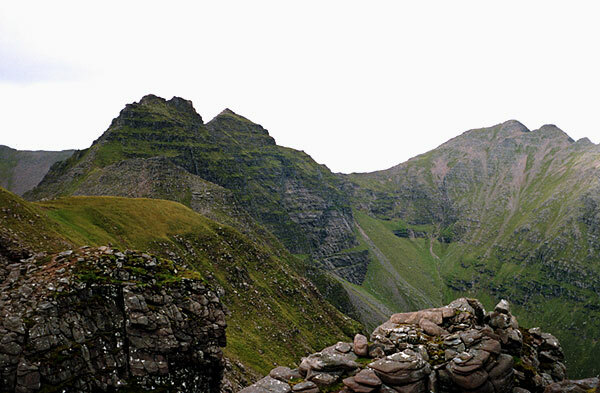 The summary information of one or more ascent routes that include Bidean a' Ghlas Thuill. 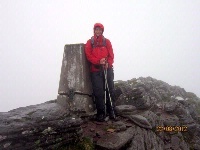 1 1590 m 15.44 km 6 hrs Bidean a' Ghlas Thuill and Sgurr Fiona An Teallach is a Scottish classic. The mountain is spectacular and the route is difficult, especially if you traverse all of the pinnacles. If you by-pass them then it is moderate with some exposure. 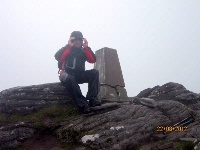 Horrible weather on the summit of Bidein a` Ghlas Thuill. 22/08/2012. No views whatsoever. Must come back. 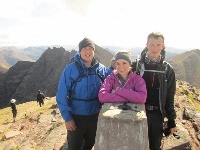 Gary, Rachel and Stephen at the summit trig of Bidean a'Ghlas Thuill nearing completion of the full clockwise traverse, a long but great day out. Post a few words about Bidean a' Ghlas Thuill or read what others have had to say. Unfortunately, I chose the only cloudy and misty day of the week to do this route. I did the clockwise route starting at the Corrie Hallie car park. Heading up to Sail Liathe. I got to the summit of Sail Liathe fairly quickly (less than 2 hrs...which is good for on old codger like me!) but mist and low cloud really gave me some problems. I took quite a few wrong turns and lost a lot of time. I headed too far west at one point climbing another peak, before the mist cleared and I could see the pinnacles that I'd missed. I followed my tracks back and then got onto the pinnacle route, electing to scramble the tops. Sgurr Fiona was next and then a hard climb up to Ghlas Thuill. This wouldn't normally have been too difficult, but I was tired and my legs were killing me. I hadn't done any Munro's for 4 or 5 years so this was probably too much after such a lay off. Unfortunately, low mist and cloud persisted for most of the day so I only caught fleeting views. Still a fantastic day. Glas Mheall Liath should not be missed if you've time. Nice boulder-hopping, some good scrambling if you want it (though all difficulties can easily be avoided) and superb views both out over the Destitution Road and back around the Toll an Lochain. Traversed "anti-clockwise. As for the pinnacles/scrambling bits, all difficulties can be avoided, though even the traverse path needs a head for heights. We did the pinnacles and L.B's seat with little problem on a calm day. We dropped off the crest a little before the last pinnacle on a little path that descends to the traverse path, but some of our party descended the last pinnacle direct and were caught out with some exposed down climbing - not recommended. I'd advise either do it clockwise, or drop off the crest just below the steep terminus of the southern-most pinnacle. Cracking views. One of the great Scottish routes, but not to be taken lightly. This is particularly true in winter, when depending on conditions the traverse of the pinnacles can be extremely difficult and pose a serious challenge to even experienced mountaineers, and requires specialised skills and equipment. This is without doubt one of Scotlands most beautiful mountains but sadly most of the paths which avoid the scrambling routes are in a poor state. Great care must be taken in poor weather. Pick a good day and the traverse of the complete ridge is an awesome expereience. If you have a head for heights have a sit down on Lord Berkleys seat where the views are magnificent. The traverse can be tackled from either end but the route from Sail Laith is the best.